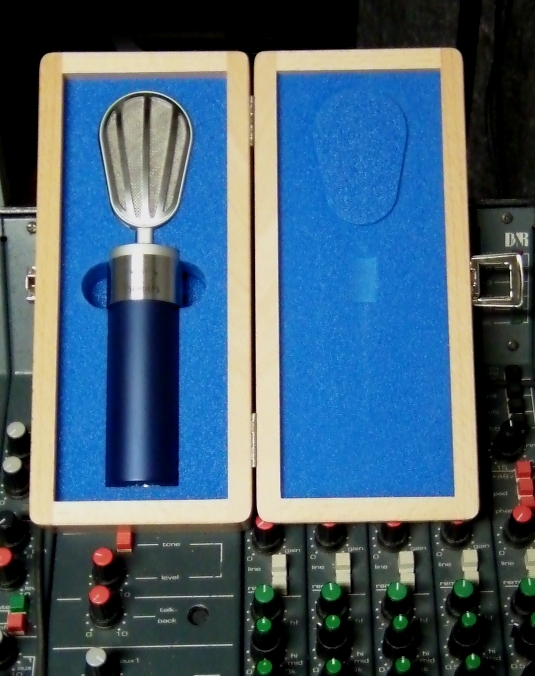 Recently I had the pleasure to try Schoeps V4 U a new studio vocal microphone. It’s a very interesting gear, lightly and small with several original technical solutions. Available in grey and blue color Schoeps V4 U is a FET microphone trasformerless and free of coupling capacitors with a newly designed electronics which offer a very high maximum sound pressure level (144 dBspl). Characteristic of this microphone is the beveled collar on the 33mm capsule which cause directivity to increase steadly and smootly at high frequencies, as in a large-diaphragm microphone. The classic look of the V4 U is based on the CM 51/3. 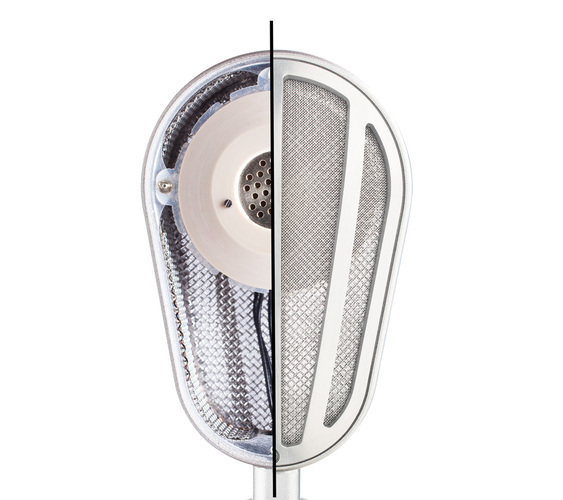 This microphone was manufactured from Schoeps from 1951-1953. The V4 U is available in two sets: The “V4 SGV set” contains the microphone, a wooden case and the SGV stand clamp, the “V4 USM set” differs from the other one for the elastic suspension USM-V4 (Rycote made). I tested it with a female singer tracking, my speech and a test signal coupled with SpectraFoo Complete spectral analyzer and I used my Neumann U87ai as reference to check V4 U nuances. I made a cluster of three microphones to compare the different sounds on the same source, all microphones were plu into a Millenia HV-3C and a DAD AX32 AD/DA converter chained with my DAW Logic Pro by Dante ethernet protocol. 1) Spectral responses and output level (I fixed a reference gain) of all microphones with SpectraFoo complete. 2) Comparison between Neumann U87ai (worldwide vocal reference) and Schoeps V4 U to check on a female singer and male speaker differences. 3) Comparison between Schoeps Colette MK4 and Schoeps V4 U to check differences for at first glance similar capsules. The spectral responses of microphones are showed bottom, the first graph is about the output level where U87ai is the reference. After I overlapped spectral response of Schoeps CMC6@MK4 on Schoeps V4 U and I checked a better performance on low end by V4 U and a identical response on mid and high frequencies. Neumann U87ai and Schoeps V4 U comparison was very interesting, because on mid and high frequencies V4 U has a flat and extended response while on low end it’s intermediate between the other two microphones. Ok, after technical stuff I explain vocal tracking of a female singer and a male speaker (myself). All three microphones are amazing and professional gears, simply my opinion is about what I found “ready to use”. 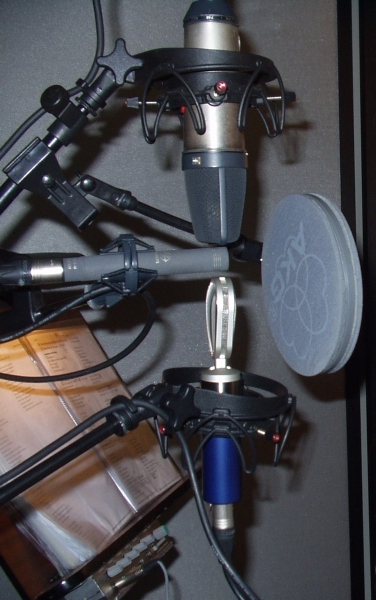 Neumann U87ai highlighted a slightly muddy sound on low end and a nastily mid-high frequency (about 3kHz); Schoeps CMC6@MK4 was smoothed on mid-high frequencies without harsh but with a lacking low end. Schoeps V4 U captured a focused, depth and natural sound with a warm low end and it kept the same smoothed and extended high end of CMC6@MK4. Transient response was very fast. Schoeps V4 U is a goal, it’s a very interesting alternative to vocal studio standard microphones (like Neumann, AKG, Brauner and others). It natural sound with a warm low end and a flat extended response is a powerful tool to capture vocal and acoustic instruments. The lack of alternatives polar responses, filters and pads are a limitation for the multipurpose applications but it’s a tipical Schoeps phylosophy to maximize microphones perfomance. Disclaimer: I tested this gear with care, nevertheless this test is inevitably affected by my opinion and possible analyzer gear and software imprecisions. Copyright © 2013-2014 by iuatwest. All rights Reserved. This material has been copyrighted, feel free to share it with others; it can be distributed via social media or pingbacks or added to websites; please do not change the original content and, provide appropriate credit by including the author’s name @ http://iuatwest.com and your readers shall not be charged by you under any circumstance. last tuesday june 03, 2014 Te.De.S. 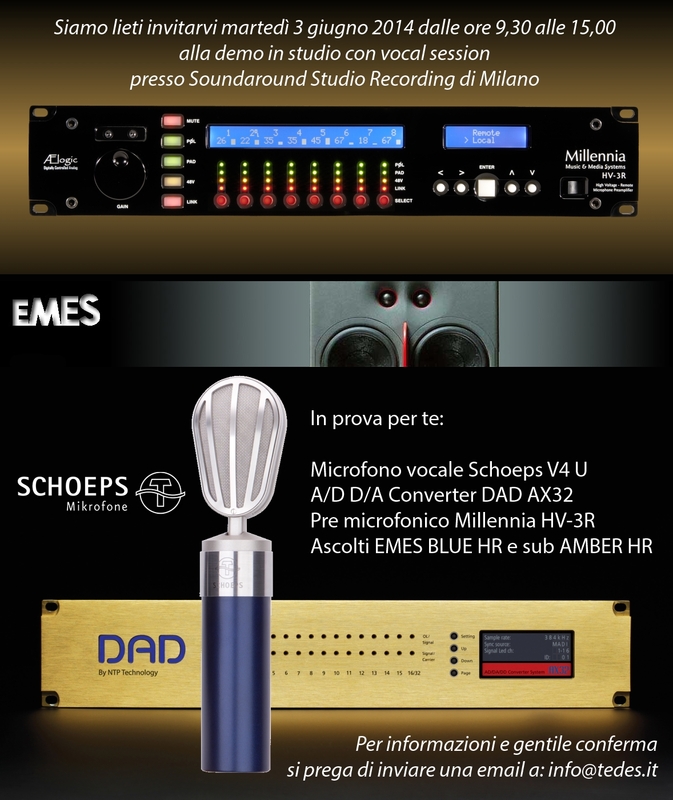 (Schoeps, Millenia, DAD and others brands importer) presented Schoeps V4 U, studio vocal microphone at our studio. The participants were many and the event was very positive feedback. I contributed with them to prepare a session to compare it with Neumann U87ai (worldwide vocal microphone reference) and Schoeps Colette series CMC6 MK4 (classic Shoeps small diaphragm). Schoeps V4 U capsule has a new small-diaphragm capsule architecture, with bevelled collar for controlling the polar response. The look of the V4 U is based on the Schoeps CM51/3 from 1951, finished in a elegant blue or grey color. They are available two kind of suspension: SGV stand clamp and USM-V4 elastic suspension (by Rycote). I recorded a female singer with all microphones together with the same preamplifier Millenia HV-3R and converter DAD AX32 and after I compared each response. Schoeps V4 U showed a smoothed response with an openness high frequency and a solid low end with a very natural image. I’ll post a Schoeps V4 U test soon. after first approach based on comparison listen (see DAD AX32: test in progress in my studio – part One), I verified frequency and phase response with Metric Halo SpectraFooCompleteX. All settings are controlled by DADman software (see figures bottom) like matrix or Mic/line switch. When you change Mic gain or Line out level you can hear the relay click on. All audio connections use DB25 with Tascam pin-out. In front AX32 has four buttons to change sample frequency and clock master, a little screen to check settings and a double series of sixteen leds to visualize carrier (digital signal) and audio presence. After I installed Dante controller and Dante virtual sound card both by Audinate and I created an audio network where my computer (with audio application) and DAD AX32 are two clients. Dante virtual soundcard has to work necessarly without a Dante PCI card compatible. It uses ethernet in your computer gateway. With Dante controller you can manage a flush of 64×64 channels audio at 48kHz@24bit or 32×32 channels audio at 96kHz@24bit with 1Gbit of bandwidth. You find all specific here. I created a multicast and I managed audio interchange to and from AX32 with virtual routing. Well, I opened SpectraFoo and I changed soundcard with Dante (it appears on available audio cards) and I ran signal generator with pink noise to test AX32. I used Transfer Function window to visualize the difference between original signal (reference) and it after AX32 AD/DA (response). In this window it’s possible to visualize Power vs Frequency and Power vs Phase. I tested AX32 at 96kHz and 48kHz. At 96kHz I checked a bandwidth very width (8Hz to 43kHz) with an excellent phase response. Also at 48kHz I checked a bandwidth very width (8Hz to 22kHz) although with a slight drift phase response at high end. Also I tested Ax32 with FuzzMeasure, an audio and acoustical measurement application, and it confirmed SpectraFoo audio bandwidth analisys. My conclusions on the DAD AX32 is that it’s the best converter I’ve ever heard. It’s very valuable into mix and fundamental into mastering because very wide bandwidth with clean mid frequency and extended low and high frequency are a necessarly conditions to work fine. today mr. Mauro Piatti, manager of Te.De.S., and Laura Lionti delivered in my studio the new DAD product: audio converter AX32. This is a modular system which manage many options: eight to thirtytwo channel AD/DA/DD, AD Mic pre, DA gain control and sample rate from 44.1 to 384 kHz. Connections avalaible AES3, MADI coax/optical, ProTools interface and Dante (TM) protocol (ethernet IP). Ax32 is controlled by a simply hardware interface (sample rate and sync) or by DADman software to manage internal I/O routing. I chained AX32 with my Apogee Rosetta 800 by AES/EBU and we compared them in real time. We listed (me, mr. Piatti and ms. Lionti) my live recording at Memo restaurant recorded at 96kHz@24bit and several master finalized in my studio. We agreed that DAD AX32 has a superb and depth sound and in particulary a better mid-low frequency detail (very important for intelligibility) and a superior presence of the high frequency. Tomorrow I’ll test further and get back to you. Voice Technologies presentation at Te.De.S. Yesterday I went to Te.De.S. (importer of several audio professional goods) to joint a Voice Technologies presentation. Voice Technologies is a Swiss company that manufactured lavalier microphones, earphones, headset and shotgun. Michel Hausmann, General Manager della Voice Technologies, introduced all products. VT500 series are a small, rectangular microphones moulded in one piece. Polar pattern is omnidirectional. VT500water/VT506water is waterproof certified IPX-7 (1 meter underwater for 30 minutes) but Voice Technologies technicians had successfully tested these gear into a lake 20meters underwater. VT400 and VT700 (headset) series are a smallest microphones on the marketplace and moulded in one piece too. VT720 is a particular strong headset version. VT900 series are a particulary headset system, it’s a single soft earhanger. All headset can easy change cable. VT5000 is a shotgun microphone, very light and short. VT60 and VT600 are earphones systems. They are composed by a very small amplifier with an acoustic tube to address the sound to eardrum. There are several kind of hangers. All series had many accesories like clip or windscreen or electret phantom adapter. It has been a very interesting discover, all products were excellently designed and Voice Technologies had pristine solution about microphones building. I tried several products and I have been very impressed for high quality and sturdy of these gears and, last but not least, for their cheapness. I recommend you to take a look.